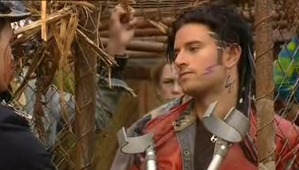 Slade appears in series five episode one of the tribe. He is self-confident and knows what he wants out of life and is willing to do what it takes to get it. Sometimes a drifter, and an opportunist who winds up in 'Liberty', the frontier-style city, fully intending to move on, but getting increasingly caught up in events. Slade is a 'Pale Rider' character. He's out for himself, and his motives are often ambiguous. But there's a basic decency there behind the gruff exterior, and he can occasionally surprise viewers with acts of tenderness. What's more he does not judge others, (except to know that they will also look out for number one). He is certainly not a 'baddie', he does not want to rule the world, but neither does he harbour any illusions about building a Utopia from the ashes of the adult world. He came into the show as an outsider, but soon became the new hero of the show. He has a love interest triangle with Ruby, and Ebony. 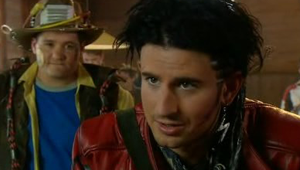 It is revealed towards the end of series five that Slade's real name is Ron, and that he is the older brother of Mega. At the beginning of series five Slade finds Ram in a trash dump, and rides away with his body. He is then seen riding into Liberty and pulls up to Rubys saloon. He asks to rent a room from Ruby for Ram, and she agrees. He introduces himself as Slade, and puts Ram to bed. Slade and Ruby become friends. Ram attempts to escape from Liberty, but is stopped by Slade. Ram wants Slade to help getting revenge on Mega, and lies to Slade about his real name calling himself Gabe. In order to get Ram out of bed and feeling better Slade brings him an old wheelchair and makes him use it to get his food. Ram is insulted and at first refuses. In the end he accepts the wheelchair. Slade helps out Lex, and Lex explains to Slade that he's looking for a guy named Ram, and he describes Gabe. Slade confronts Ram, but doesn't reveal to Lex that Ram is there. The two bond over how Ram ended up in a wheelchair. Slade goes on a quest to find computer equipment, and stumbles upon crutches. 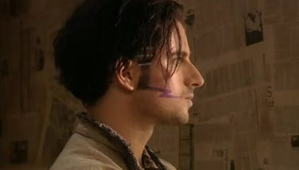 Slade is captured by Ebony and ends up being a prisoner. Later he escapes. Ruby and Ram have an argument as to who Ram really is. Ram refuses to use the crutches Slade got for him. Ruby and Slade spend some quality time together, which is interrupted by Ram trying to use the crutches. Ruby and Slade spend the night together. In the morning Ruby doesn't show her real emotions when Slade does not discuss their night together. Lex shows up in Liberty again, and Slade entertains Lex while Ram hides. Lex pays Ram a late night visit attacking Ram and tries to get information from him. Slade and Ruby come to Ram's rescue and knock Lex out. When Lex comes too he tells Ruby who Ram really is. She is angered about Slade's lies. Slade prevents Lex from escaping. Ram wants Lex deleted, but Slade won't hear of it. Lex is angry when he wakes up handcuffed to the bed. Ruby decides to have some fun and teases Lex. Slade goes to the city to find out more about the Zoot sightings. Ruby prevents Ram from murdering Lex. Lex manages to get out of his handcuffs. Ruby convinces him to go easy on Ram, and Lex promises to make Ram's life a living hell. Slade tracks down Ebony. Lex and Ruby explain their deal to Slade, who has now returned to Liberty. Slade learns that Ebony was married to Ram. Ram explains to Lex that he had nothing to do with Zoot. Ram and Lex accompany Slade to the city to witness Zoot rise again. Slade leaves to check around. Lex and Ram are spotted by city kids who attack them, but they manage to escape. After Darryl's Zoot performance Mega Zaps him and throws him into the trash. Slade finds Darryl. Slade sees Ebony in a very bad state, and later that night visits Ebony, but escapes as Siva enters the room. Slade brings more technology to Ram, and then embarks on another journey back to the city. Ruby wants Lex to go back to the city and warn his friends about Mega. Ebony waits for Slade to appear. Slade talks to Siva letting her know that he isn't harming Ebony. Lex puts on a Mexican disguise and goes to the city. Ebony comes to a realization that she has been taken for a ride. Siva tells Ebony that Java is messing with her mind. Lex is caught by Java's people and ends up a prisoner in the zoo. Slade searches through a hospital looking for equipment. Ram is overjoyed when he manages to walk. Slade brings the medical equipment to Darryl, whom he had left there to recover. Darryl is surprised by Slade helping him out. Ruby saves Ram from a band of thugs. Lex and the others manage to escape. He takes Siva back to Liberty. Slade convinces Darryl to stay at the hospital. Siva is shocked to find Ram in Liberty, and walking she tells Ruby about Ram. Slade brings Ebony to the hospital and introduces Darryl. She learns how Mega used Darryl to impersonate Zoot. Ruby prepares to destroy Ram's computer. However, Ram stops her by explaining that he's working on a cure for Slade's illness. Darryl and Slade return to Liberty. Slade knows something is up when Ruby begins acting weird around him. Ram admits that he told Ruby about his illness. Refugees try to find shelter, and Ruby helps out by providing space. Slade isn't happy with having to lie to Ruby, and goes back to the city. Siva and Ruby learn that Lex has been taking other people's stuff in exchange for rent, so they teach him a lesson. 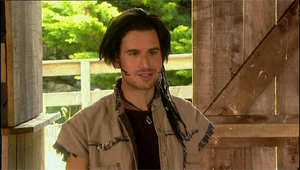 Slade fixes Ebony's dislocated shoulder, and warns her that Mega is turning her into the enemy. Ruby learns of Lex's idea to run a casino and agrees with it. The casino is an immediate hit. Siva learns that Lex has rigged the casino, and Ruby wants half of Lex's earnings. Ebony is set up by one of her Zoot supporters and Java makes an entrance. Just as she's about to waste Ebony, Slade rushes in and whisks her away. Ram watches from his camera. Ruby witnesses Lottie pick pocketing jewelry, and gets her to steal Lex's notebook. Slade offers to take Ebony to see Siva. Ruby confronts Lex about the casino profits. Ram agrees to make the casino more profitable if Lex steals some software from Mega. Ram copies Lottie's bar code on Lex's arm. Slade returns with Ebony. Ruby sees Ebony coming out of Slade's room. Lex goes to the city to retrieve the software and warns Jay that he might find some people at Liberty. Ebony listens in as Siva explains to Ruby how she took care of Ebony as a child. Jay arrives at Liberty, and tries to kill Ram, but the others stop him. Slade warns Jay that it will be tough making a deal with Ebony. Ruby and Slade spend the night together. Jay and Ebony discuss their past and agree to put it behind them in order to create an alliance against Mega. Jay and Ebony ask Ram to join them, and agree that Slade should be the head of the alliance. After spending the night with Slade, Ruby warns Ebony that she can't have Slade. Slade feels guilty for not telling Ruby the truth about his health. Ebony thinks Slade is just stringing Ruby along. Siva and Ebony spend more time together. Java receives a note to meet Ram and is shocked to sees Ram walking. Ram convinces her to come back to Liberty. Ruby confides in Siva about Slade's illness. When Java finds out, who is at Liberty, she wants a fight to death with Ebony. Ram is concerned over Java's life, but Java won't backdown. Slade tries to run Java out of town, but she stuns him. Siva tries to convince Ebony to run from town. She talks to Lex about her sisters, and exits Ruby's saloon just in time to see Java pulling a Zapper on Ebony. She throws herself in front of Ebony and ends up getting shot. Ebony kills Java and is forced to watch Siva die. Friends gather for the mourning of Siva and Java. Ram tells Ruby why he feels guilty for the deaths of Java and Siva. The rebels decide to go back to the city. Slade comforts Ebony and they get closer. Ruby is furious when she realizes Ebony and Slade spent the night together. Mega's broadcast is interrupted by Ebony who reveals Darryl as the Zoot impostor. Ram wants Ebony out of Liberty after she brawls with Ruby. Ebony and Slade use explosives on the safe zones fences as a warning to Mega. Lex and Darryl learn that Ram and Slade tricked them into getting the software Ram needed. Ebony tries to play mind games with Ruby until Ruby reveals that she is carrying Slade's child. Slade learns about Ruby's pregnancy and feels guilty. Ruby quizzes Ram and ends up realizing she's a fool. Slade has to breakup a confrontation between Ebony and Lex. Ruby confronts Slade about his lie. The rebel alliance tries to come up with ways to help Amber and Jay. Lex talks with Ram about setting up a trap for Ebony. Slade tries to explain things to Ruby, but she won't listen. Ebony overhears them. During the deletion process, Ram and Jack attempt to gain control of Mega's system, but things don't go as planned. The rebels overthrow Mega with Ram's help. Lex goes through with his plan to eliminate Ebony, but at the last minute decides to help her out, and reminds her of Siva. Ebony and Lex corner Mega, and they're about to take him out when Slade stops them and reveals that Mega is his little brother. Mega is put in a cell. Ram, Ruby and Lottie arrive at the Mall, where they are welcomed by the Mall Rats. Slade tells Ebony the story about Mega. Amber and Jack learn about Ram's computer having Zoot's face. Lex trades the keys to the cell in exchange for information from Mega. Amber gets Ram to give Jay his memory back. Slade tries to explain why he had to leave Mega, but Mega won't hear any of it. The Mall Rat's throw a party. Darryl tells the others about Mega's escape. Ram is worried when the computer disobeys him, and seems to have a will of its own will. Ebony and Slade rush to Ram's side when Mega tries to kill him. The party is in full swing when the power goes out in the entire city. Ram is shocked when A.I. Zoot takes over the city. May gets Ruby a pregnancy test. Ram learns that the computer intends to eliminate all humans. Jay, Amber and Jack learn about what A.I. Zoot is doing and try to enter the bio-chem lab, but are stopped by a laser. They rush to find out what's in the lab, and Mega reveals it's a virus. The Mall Rat's rush to warn the city. Ram compliments Mega in order to get him to help beat A.I. Zoot. Slade and Lex manage to destroy the laser. A.I. Zoot and Mega duel inside virtual reality. Slade learns that there's no way to stop the virus, and Mega dies in his arms. Ebony throws Ruby in front of a truck, but Ruby isn't hurt. Ebony is stricken with guilt when she learns that Ruby was never pregnant. The Mall Rat's run to the boat and watch as the virus is released in the city. 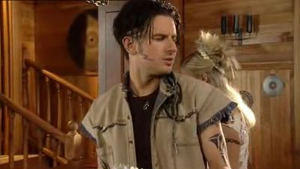 Slade has a tribal tattoo on his left arm, from his lower bicep and over his elbow. His tribal face markings are simple, with a lightning strike on each cheek, there is a small scar over his right eyebrow. He wears his hair long with braids/feathers down the left side. Slade has only ever had one costume. He wears a singlet top made of a mesh material. It is lined on the inside with a matching brown stretchy fabric, which is also used for the trim around the neck and arm holes, there is a strip down one side missing, showing the skin underneath. He covers this top with a sleeveless tan coloured denim jacket, rounded at the bottom with a high neck. The arms, neck, bottom and seams are all frayed, giving it a worn look. He wears leather trousers with suede making up the main part of the legs. The bottom of each leg has a separate piece with two buckles, and on the left side is a design in red paint. The back of the trousers also has the contract leather/suede design, with leather panels around the bum and the two back pockets. 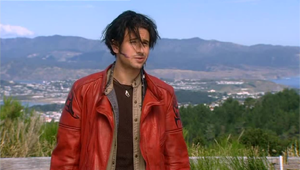 Slade wears a padded red leather biker jacket with a zip running down the right side of the jacket, not down the middle. There are two pockets on the bottom and one on the chest. The sleeves and back have tribal markings similar to Slade's tattoo. Finishing off the outfit is a pair of cowboy boots, which sit perfectly on Slade's motorbike.